We've added various types of exercises for adding & subtracting two-digit numbers mentally, mostly matching what is taught in Math Mammoth curriculum, in grades 1-2. 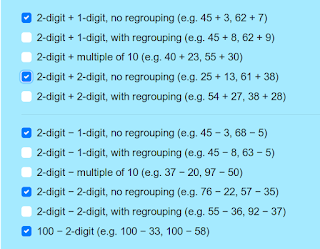 For example, children can practice adding a two-digit number and a single-digit number WITH or WITHOUT regrouping... e.g. 45 + 3 is without regrouping, but 45 + 8 is with regrouping. Or they can practice adding/subtracting multiples of ten (56 - 30 or 34 + 60). See more examples in the image above! Here's the link for the online practice page (and it's AD-FREE, plus not made with Flash): Two-digit addition & subtraction practice – mental math. 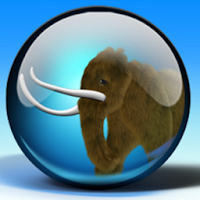 New in the Math Mammoth online practice section! 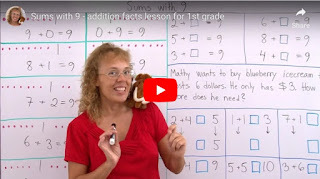 Fact families is one of the main approaches I've used for addition & subtraction facts in the Math Mammoth curriculum. For example, in the online practice program, you could choose to practice fact families with 6. This means you will get addition & subtraction problems like what you see in the picture below -- and also including missing number problems. This is a big announcement! I have the pleasure to announce a NEW section on Math Mammoth website that focuses on ONLINE PRACTICE for various math concepts! I am sure that many of you will get lots of use out of this new section. The scripts there have been made by my son; let's just call him Codelover 😃. He's still pretty young, but he loves coding and web development, and has been learning a lot about those topics right and left for a while now (mostly using courses from Udemy). I do have a favor to ask though. He made this section in such a manner that it SHOULD work offline (it's something called "progressive web app"; I don't personally understand these concepts nearly as well as he does so I won't even try to explain it). It seems that sometimes it's necessary to RELOAD the page a few times to make it work offline. A customer asked me about reviewing addition/subtraction facts from 1st grade. The child is currently in 2nd grade but those facts continue to be a weak point, despite flash cards, daily drills on paper, and online drills in the past. Check out these videos, which show you how the addition facts are taught in MM grade 1. Subtraction facts don't need memorized separately. If you know that 5 + 4 = 9, from that you also know that 9 - 4 = 5 and 9 - 5 = 4. So, subtraction facts become "missing number" addition problems. For example, 7 - 3 = ? Think: which addition fact is this one: 3 + ___ = 7? You can most likely make worksheets for her based on those videos. Additionally, we offer FREE ONLINE practice for addition facts here, and using the fact families approach here. The printed versions for the Math Mammoth Blue series books are now available in FULL COLOR. 😃 They're available through Lulu.com, as before, and printed on-demand. To find these, first locate the books you're interested in the list of Blue series books at MathMammoth.com. Then, for each book, you will find a link to Lulu listed under the cover image of that book. Check out also https://www.lulu.com/ home page for coupon codes; they run promotions often! Here are neat puzzles to review factors in multiplication, the multiplication tables -- and consequently, the basic division facts -- all in the same "package"! 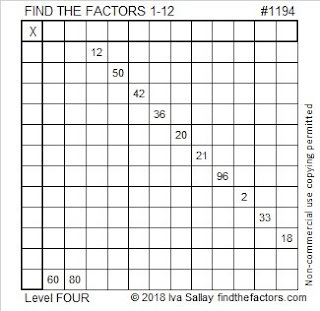 They're called Find the Factors puzzles. This page explains how to solve them. Like the author says, "The more multiplication facts you know, the easier these puzzles become. Working on these puzzles can help you learn the multiplication table better."